The pH miracle diet is a revolutionary new way to look at how you eat. The essentials of the diet are to keep the ph balance of food intake at 80% alkaline with 20% acidity. The goal with this diet is to match the ph level of the bloodstream, which runs on the alkaline side. This task can be daunting for many because foods that most people love to indulge themselves on are considered high in acidity. The goal in adding more alkaline into your diet is to identify good sources of alkaline. Creating a comprehensive list of alkaline producing foods will help you make the most of the pH miracle diet. Alkalizing foods have a tonic effect on the body. By neutralizing the acidity in the bloodstream, alkaline foods act as a breath of fresh air to the system regenerating and restoring damaged cells. Diets high in acidic foods cause the body to break down prematurely, the bloodstream carries these acid bombs throughout the system wreaking havoc in their wake. By determining what foods have an alkalizing effect on the body, we can incorporate them into our diet in larger amounts, setting the pH levels in the bloodstream to the optimum level. On average, the pH level of human blood is between 7.35 and 7.45; levels 7 and above are considered alkaline. Vegetables and fruits are the easiest ways to get more alkaline into your diet. Vegetables that are alkalizing are: alfalfa, barley grass, beets, beet greens, broccoli, cabbage, carrot, cauliflower, celery, chard greens, collard greens, cucumber, dandelions, eggplant, garlic, green beans, green peas, kale, kohlrabi, lettuce, mushrooms, mustard greens, nightshade veggies, onions, parsnips, peas, peppers, pumpkin, radishes, rutabaga, sea veggies, spinach, sprouts, sweet potatoes, tomatoes, watercress, wheat grass, and wild greens. Fruits that have an alkalizing effect are: apples, apricots, avocados, bananas, berries, blackberries, cantaloupe, cherries, coconut, currants, dates, figs, grapes, grapefruit, honeydew, lemons, limes, muskmelons, nectarines, oranges, peaches, pears, pineapple, raisins, raspberries, rhubarb, strawberries, tangerines, tomatoes, tropical fruits, and watermelon. Protein can be a problem when attempting to add more alkaline into your diet. All protein derived from animals is acidic. It is possible to add protein to your diet that will have an alkalizing effect in your bloodstream. Proteins that are alkaline are: almonds, chestnuts, millet, tempeh, tofu, and whey protein powder. Food is nothing without the spices, herbs and sweeteners that give it that extra bit of character. You can add these alkalizing additions to your culinary efforts to bring your PH levels into balance. Alkalizing condiments are: cinnamon, curry, ginger, mustard, chili pepper, sea salt, stevia, miso, tamari, and all herbs. Minerals are essential to optimum health. Paying attention to which minerals have alkalizing effects can add the proper balance to your blood pH. Minerals that have an alkalizing effect on the body are: cesium, potassium, sodium, calcium, and magnesium. 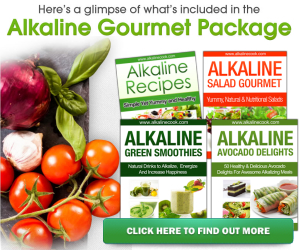 There are other incidentals that can make adding alkaline to your diet even easier. Other ways to add alkaline to your diet are: apple cider vinegar, alkaline antioxidant water, bee pollen, lecithin granules, molasses, probiotic cultures, soured dairy products, green juices, veggie juices, fresh fruit juice, and mineral water. Knowing which foods and supplements that add alkaline to your pH levels is just the beginning. Implementing them is the next step which takes planning and commitment. After adding these healing foods to your diet you can test your bodys pH levels with a saliva strip test available at most health food stores. Keeping your pH level between 7 and 8 is the target for good health. Remember the goal of the pH miracle diet is to have the alkaline intake higher than your acidic intake. This does not mean that you cant enjoy the foods that are higher in acidity, quite the contrary; the balance of your diet should be geared toward alkaline producing foods. By maintaining a proper pH balance you can ensure that your body is performing at its optimum level.